Even though St. Pio was well known for having prayed the rosary many times each day, it was not so much the centerpiece of his life as it was his compass. And where did it point? The Second Vatican Council very clearly reaffirmed the central place that the Mass occupies in the life of the Church and likewise in the lives of all of Her members saying “The sacred liturgy is the font from which all of the Church’s power flows; it is the summit toward which all of the Church’s activity is directed” (cf SC 10). In light of this, it seems to me that those oft-ridiculed Catholics of old who assisted at Holy Mass while praying the rosary were actually on to something very important. 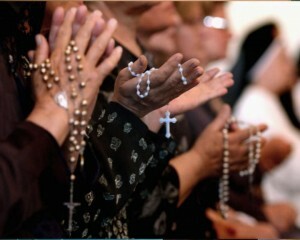 Now, I am not advocating that we take up the practice praying silent rosaries throughout the celebration of Holy Mass, but I do wish to say that contemplating the mysteries of the most holy rosary can be of tremendous benefit to all who wish to “grow in their awareness of the mysteries being celebrated in the Mass, and their relationship to daily life” (cf Pope Benedict XVI – Sacramentum Caritatis – 2007). As such, one might think of the rosary as a “weapon of Mass instruction;” a benevolent teacher just waiting to be approached by all who are eager to develop the interior disposition that is necessary to participate in the sacred liturgy in a truly fruitful way. With the implementation of the new English translation of the Roman Missal less than eight weeks away, starting today I will offer in preparation a series of weekly reflections on the mysteries of the rosary and how they relate to the underlying realities that are made present to us at Holy Mass. In sharing these thoughts, my hope is to encourage you to take up the rosary on your own with the intention of seeking the guidance of the Blessed Virgin Mary, that she might lead you ever more deeply into the sacred mysteries that we celebrate toward a renewed encounter with her Son. We’ll begin with a look at the Joyful Mysteries. In the Sanctus, it is as though a new birth is being announced! It is at once a heralding of the Divine Presence that is about to come in the Most Holy Eucharistic, but it also the pleading of God’s People for the Lord to come to our aid, He who alone can save us. Hosanna! Similar to the Incarnation foretold by the angel Gabriel at the Annunciation, the Eucharistic Lord will become present to us in the Mass by “an overshadowing” of the Holy Spirit. He who once humbled Himself to come in the flesh as an infant in the manger, that He might walk among His people, will humble Himself once more at Holy Mass under the appearance of bread and wine upon the altar, that He might become “truly and mysteriously made present” (CCC 1357) and operative among us in no less substantial way. In the Most Holy Eucharist, however, it is the Risen and Glorified Lord who comes before us; the Son of the Most High who shall reign in the house of Jacob forever. We must recognize, therefore, that while the altar at Holy Mass is indeed the Altar of Sacrifice, it is also the throne before which the King of kings gathers and feeds His pilgrim people. By faith we also know that wherever one finds Christ, there too does one find Mary, our Blessed Mother and His. She is indeed Mother of the Most Holy Eucharist; she is the Chosen Chalice in whom the Eternal Son chose to “humble Himself to share in our humanity,” and so it is fitting for us to turn to the Blessed Virgin at Holy Mass, asking her to lead the way to her Son. Though we recognize and proclaim that we are unworthy to receive Him, we will follow the example of Mary, our Mother and model of faith, by turning to the Lord who deigns to enter the abode of our soul, repeating after her, be it done to me according to thy word, accepting with humble gratitude and awe the great gift that is offered in Holy Communion. Speaking of an encounter with the Lord at Holy Mass “refers not only to the celebration of divine worship but also to the proclamation of the Gospel and to active charity. In all of these situations it is a question of the service of God and neighbor. In a liturgical celebration the Church is servant in the image of her Lord, the one ‘leitourgos’; she shares in Christ’s priesthood in worship, which is both prophetic by way of proclamation and kingly in the service of charity” (cf CCC 1070). In order to participate in the liturgy in a truly fruitful way we must therefore model ourselves after Mary who, following the Incarnation, did not simply revel in her blessedness; rather, she continued to embrace every opportunity to participate in the work of Redemption, carrying the Real Presence of Jesus Christ within herself out into the world in service to others – in the case of the Visitation, to her cousin, Elizabeth. It is not enough, therefore, for us to simply receive the Lord at Holy Mass without also embracing the call to give, and so the liturgy by its very nature is a “sending forth” wherein those who are nurtured in the Blessed Sacrament are called to go in peace to build the Kingdom of God on earth in preparation for His glorious return. In recent decades, unfortunately, we have all-too-often crafted liturgies that seem to stress the call to service aspect of the Mass to the near exclusion of the great sacred mystery of the Lord’s presence that absolutely must precede and accompany it. In other words, our failure has been “doing liturgy” in a way that seems at times to encourage a “Visitation” while giving but fleeting consideration to the Annunciation! As always, contemplating and emulating the mysteries of the most holy rosary can reestablish order in our lives and in our worship, giving renewed meaning to our vocation as members of Christ’s Body by helping us to remain aware that our calling is not of this earth; rather, it is to serve one another in such way as to “magnify the Lord and to rejoice in God our Savior,” because apart from this – in spite of our greatest efforts to promote a just society — in truth, we can do nothing. We will continue our reflection on the Joyful Mysteries next week.